Wootz! I make my own Overnight Oats. It is a delicious, healthy, raw and quick to prepare breakfast and snack. Basically is oats mix it together with yogurt, milk, fruit juice and fruits then soak it overnight in the fridge. The next day it will be soft and tasty. I try to make it simple and flexible so that you and I can do it often at home. Well, it only takes about 15 minutes at the maximum to prepare. All the ingredients that I used are fresh and loads with goodness that will surely boost our day. Look! I got organic rolled oats (instant) and Nestle Natural Set Yogurt as my major ingredients. If you do not have organic rolled oats at home, you could replace it with any instant oats. As you know oats is a super food, it is rich in fiber and can help to lower down our cholesterol, diabetes and weight. Of course, yogurt is a natural source of good bacteria / probiotic for our body digestive system. Strawberry and blueberry is the source of vitamins and minerals. I prepared it in a glass jar also. This is a good way, when I do not have time for breakfast at home, I just grab a jar of Overnight Oats Parfait and had it in the car or when I reach office or I could keep it for snack in the afternoon. 1. 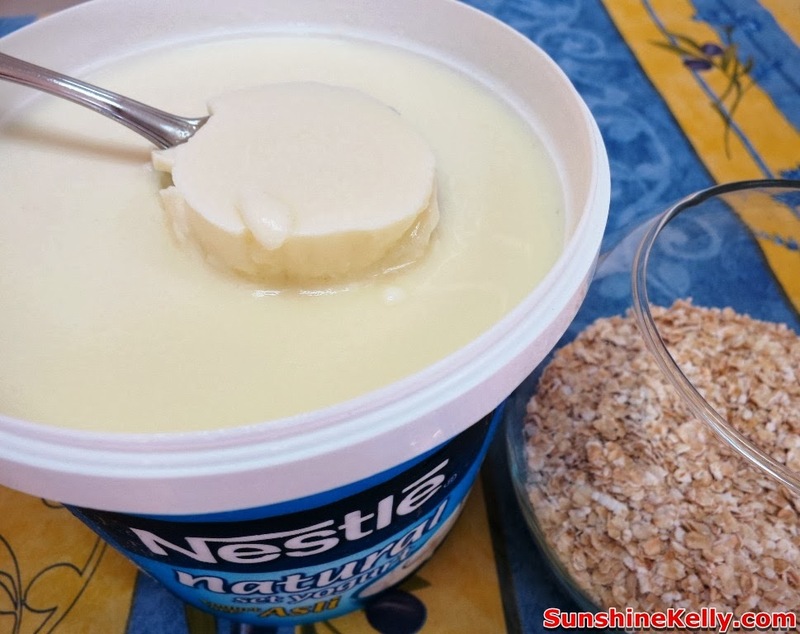 Mixture A: Mix the Organic Rolled Oats, Nestle Natural Set Yogurt, Low Fat Milk and honey together. 2. Mixture B: Separate 1/4 of the Mixture A and add the strawberry juice. This is optional. 3. Pour the Mixture B at the bottom of the glass jar / glass. Add blueberry. Then pour Mixture A on top of the blueberry. 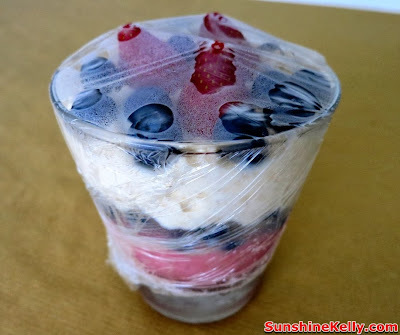 Then add some fruits on top. Close the jar and cover the glass with shrink warp. Leave it in the refrigerator overnight. And its ready to serve. This recipe is flexible, you could add any type of fruits, dried fruits like raisins, apricot, fig, nuts, chocolate, seeds, peanut butter and crunchy cereals. So what is your favourite add-ins? 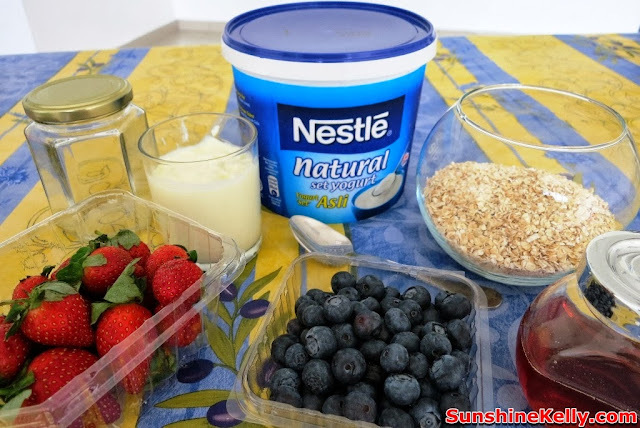 Now, you can prepare your breakfast the night before so that in the morning you do not have to rush and still get your nutritious and delicious breakkie. What is your regular breakfast? I tasted the nestle oats and it tasted super disgusting. I almost dumped the whole thing but i thought it was such a waste. 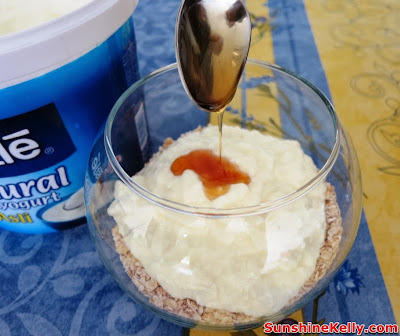 Luckily i searched up how to make set yogurt tasty, or else i am going to waste such a goodness! 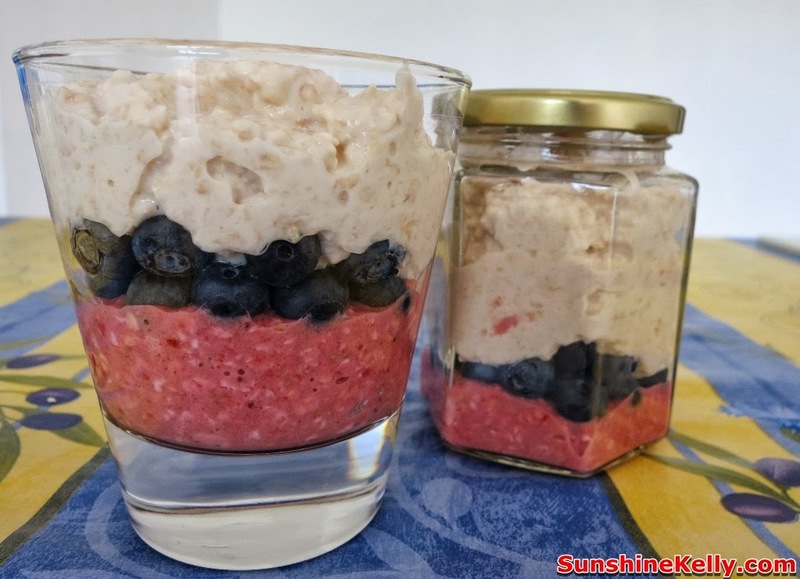 This is a good recipe, i love oats very much and i eat them every morning. The oats and the set yogurt are a good mixture. 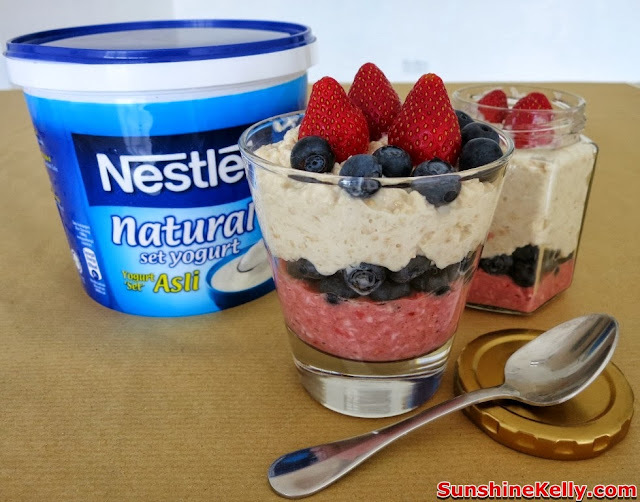 Thanks Ellen, i love overnight oats too and its healthy.